The only question I really have is how can anyone be a member of this site and not see through this for what it really is? The timing alone tells the whole story. I really have nothing more to add because if you don't get it by now you most likely never will. You think the FBI is just going to cover it up like they always do? Obviously the media will do anything to make it seem like it was a Trump supporting alt-right conspiracy theorist nazi. I have a hard time believing true justice is ever going to come. The fact that the Stamps weren't marked makes it easier to find this idiot, not harder. The packages were HAND DELIVERED. Think CNN has a security Camera or two? You said it yourself though - husband kill the wife. This was the most elaborate failure I've ever seen. Or CNN is part of the hoax. No nerve hit there. lol sorry if I sounded a little terse. I think words in print sound a little harsh to the reader when it isn't really the tone the msg was supposed to be in. So to respond I would say this....i find it highly unlikely that this is the work of anarchists. my bet is it is going to be blamed on a lone nut or a republican(my first guess) and thus blamed on all those on the right(which is stupid because you can't blame a whole party for a few idiots). Also Fringe groups do exist in anarchism because a basic tenet is that you cannot make strategies, tactic's, and rule's binding to any group for any reason, and all must be allowed to follow or go their own route, lest it become the tyranny of the majority. Yes I've heard they have a strong presence in Oregon, I believe it all started for that state in Eugene and while back. As for ANTIFA...i think they are schmucks. The reason I say this is because, although I'm positive they would claim the black flag(anarchism) as theirs, they aren't truly anarchist's because they seem to only be attacking far right nationalists instead of allowing for a difference in opinion. they should be making inroads with those folks and then attacking the power structure instead. simply put they have forgotten their history and are making the same mistakes of the past, which is why they have been mostly annihilated. they are acting on presumptions, and like many other groups are quick to scream ''Bigot! Nazi! Racist! Sexist!'' not based on fact but based on emotion. They are just Soy Boy litlle pukes, that have a horrible strategy and I think the make real, intellectual anarchist's, cringe. Dollars to donuts this is the work of a desperate Democrat agenda(in it's death throes before the midterms) to be blamed on Republicans. Hmm... I will play the Devils Advocate here . The Left sent those Packages to Themselves as a Calculated Political Move , then Imply some " Alt/Right " Person did it . Isis flag makes me think Russians even more. World News Bureau is run by a man claiming to be from Scottsdale, Arizona who goes by the name Scooter Van Neuter and also runs the parody news site BigHairyNews.com. Van Neuter is a frequent commenter on right-wing websites like Breitbart and The Daily Caller, and his account was permanently suspended from Twitter in 2017. I didn't notice, did the perp sign the bomb "Billy Bob"? Uhhhhhh, yes if it is one person the whole group will be blamed. 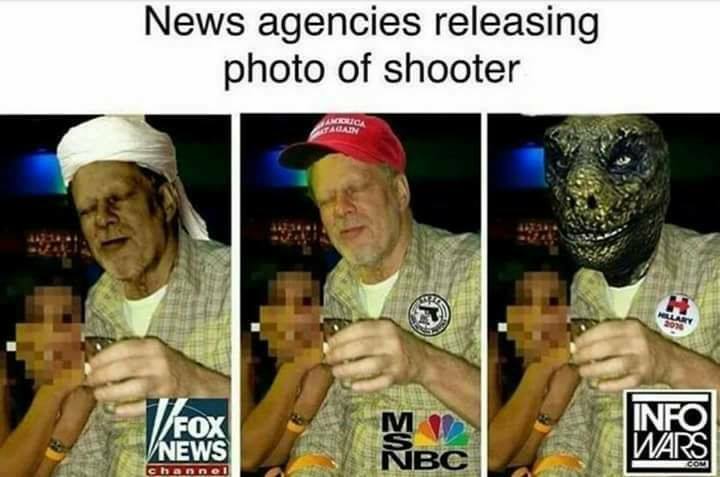 Every time there is a shooting in the US there is only one group of people that get the blame. No matter who is responsible.